You've heard it said that the Christian life is a journey. The truth is, the Bible calls all believers sojourners in a strange land, just like Abraham (Heb. 11:9). However, after being born again, you aren't left here and expected to just survive. No! God has prepared you to overcome in this life. The contents of this kit will help you renew your mind to both survive and overcome any circumstance that may arise during your journey here on earth. 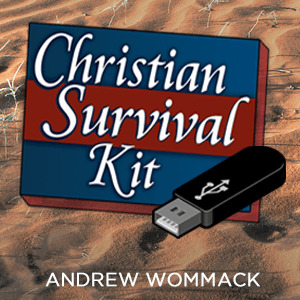 16 of Andrew's instructive teachings on USB drive, including both the audio and As-Seen-on-TV video include: Don't Panic—Believe, Put Things in Perspective, Knowing God, The Power of the Word of God, The Ministry of the Holy Spirit, Be a Doer of the Word, Self-Centeredness: The Source of All Grief, Watch Your Tongue, Abiding in the Vine, The Power of Love, The Power of Joy, Fruit, Not Failure, Glorifies God, How to Handle Persecution, Sin, Righteousness, and Judgment, Prayer in Jesus' Name, What to Do When Your Prayers Seem Unanswered.